To be known as ‘Scotch whisky’, a mash of cereals, water and yeast must be distilled and matured in Scotland for a minimum of three years in oak casks. There are two main types of whisky produced in Scotland: malt whisky and grain whisky. All whisky begins its life as the product of a ‘single’ distillery – so these products are known as ‘single malt’ or ‘single grain’. Single malt whisky is made in a traditional batch process using a copper pot still. According to the Scotch Whisky Regulations 2009, to be classifed as a Single Malt Scotch Whisky it must be "produced from only water and malted barley at a single distillery by batch distillation in pot stills". Single malt is the premium, traditional style of whisky, but the artisanal manner of its production is not easily scaled. The production of single grain whisky is very different. Unlike single malt, it can be produced from a variety of different grains or cereal types, either malted or unmalted.Single grain whisky is also made continuously via a modern column still, on an industrial scale. The output is purer in alcohol, but with much less flavour and character than a single malt. The overwhelming majority of Scotch whisky consists of malt and grain whiskies mixed together to make a product known as blended Scotch whisky. Blends have dominated the Scotch industry for over a century, and continue to do so today. In 2015, blended Scotch whisky accounted for 70% of exports by value and 90% by volume. In comparison, bottled single malt Scotch is still a relatively niche category, accounting last year for only 9% by volume and 24% by value of all Scotch whisky shipped overseas. By law, the age statement shown on a Scotch must refer only to the youngest whisky included in the product – meaning that all malt and grain whiskies included must be at least as old as the age shown on the bottle. Most Scotch is bottled between the ages of 3 and 12 years. Three years is the minimum age for a spirit to be classified as 'Scotch whisky', and many ‘value’ products, such as supermarket own-label blends, will likely consist of whisky at this age. At the same time, Johnnie Walker Black and Chivas Regal, which account for 10% of all Scotch sales worldwide, are both 12 year old whiskies. The most important fact about malt and grain whisky is that they are both components of the same finished product – blended Scotch. As commodities, however, there are a few differences between malt and grain which are worth considering. The different methods used to produce malt whisky and grain whisky mean that there are huge differences in the production capacity of the distilleries which make them. There are currently 109 active malt distilleries, and 7 active grain distilleries. The largest malt distillery, Glenfiddich, can produce 14m LPA per annum, while the smallest, Abhainn Dearg, can only make 0.02m LPA in one year. These figures are dwarfed by those of grain distilleries. Cameronbridge, the largest grain distillery, can produce up to 105m LPA of whisky each year. Even the smallest grain distillery, Loch Lomond, can still produce 18m LPA – several million more than is possible at Glenfiddich. So, despite the fact that there are over 15 malt distilleries for every grain distillery, Scotland normally produces more grain whisky every year. 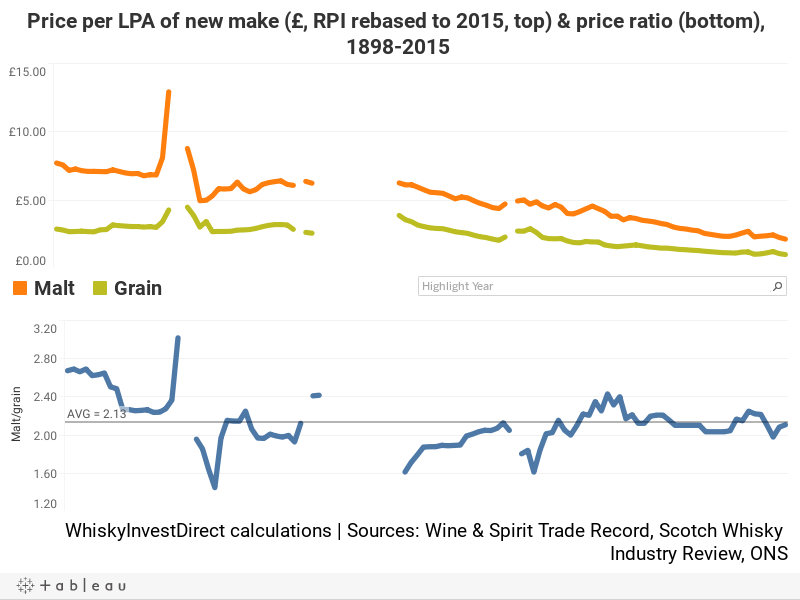 In 2014, 350m LPA of grain whisky was produced, compared to 306m LPA of malt. For both new malt and new grain spirit, the distiller's selling costs are historically far more closely related to the costs of utilities and grain required for production than the selling prices of the finished product. Due to the low number of grain distilleries, it is easier to manage the production of grain whisky than malt whisky. In periods of over-production, the taps are, quite literally, turned off. This is more difficult with malt whisky, due to the higher number of distilleries – and distillery owners. In the early 1980s, this caused a delayed reaction to slowing worldwide demand for Scotch, which was ultimately only resolved by a raft of malt distillery closures. Today, however, two producers – Diageo and Chivas Brothers – own distilleries with a total capacity of 180m LPA – nearly half of the total full capacity of 370m LPA in Scotland. Distillers have also become better at forecasting future demand levels. This has reduced the danger of high-level over-production, like that of the 1980s, re-occurring. In a blend, grain provides the bulk of the body of a blend, while malt provides the more complex flavours. For this reason, malt whisky used in a blend is often older than the grain used. The typical bottle of blended whisky is 70% grain, 30% malt. More premium offerings may include a higher percentage of malt. 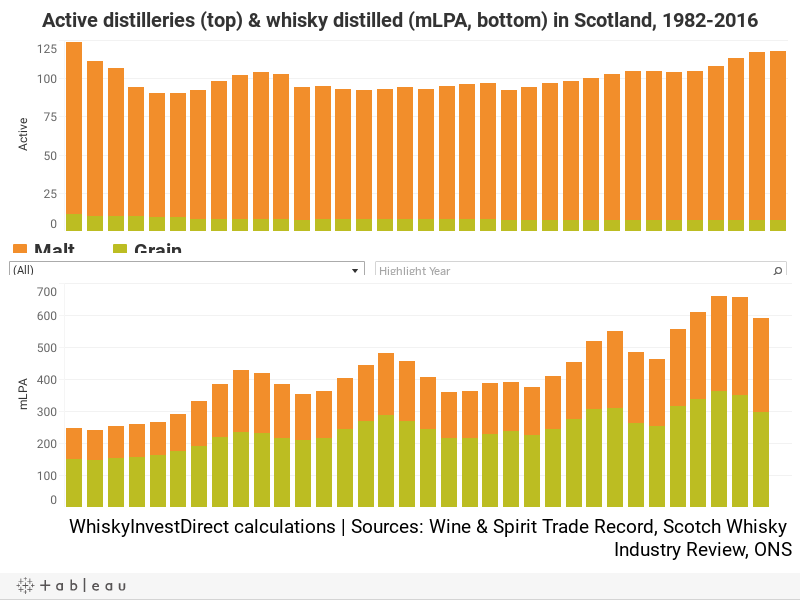 As few distilleries produce grain whisky, and as the spirit which they all produce is relatively homogenous, there has not historically been a significant variance in the price of grain whisky at the same age from different distilleries. This is not the case for malt, where prices for whisky from different distilleries may vary more widely.